someone asked if i'd be more specific about what i do on translucent paper. yes, of course! this is the front and back of what i lay the translucent paper on while i'm drawing. it used to be a pad of watercolor canvas, but i took the canvas out, flipped the cover over so the white on the inside was on the outside, and taped it to the back - which conveniently happened to be black. both sides are useful. i use the white side while i'm drawing and coloring, then i put the drawing against the black side to see if i've missed any areas. also, since i leave the eyes, lips, and outline of the nose free of color, i like to see if i like the amount of 'open space' i've left - the black shows you this instantly. i grabbed this face out of my manila folder of pieces in various stage of the process this morning; i painted it several weeks ago with white acrylic paint (i don't know how the turquoise got on there)... i'm showing it against the black so you can see that there isn't much going on initially, and you can see the unpainted areas clearly. here she is after i colored her with colored pencils and graphite. i used my 8B pencil for the pupils of her eyes, otherwise it's just my mechanical pencil and miscellaneous colored pencils. when i was finished, i laid her over mrs. du pre, which is the page i finished yesterday in my 'daily book'.... i laid the waxed paper on the page, it's not taped or glued down - i just wanted to see how it looked. i liked it there but not enough to cover up mrs. du pre. the thing that i don't like about using oil or acrylic paint for the skin is that you can't see through it; colored pencils or oil pastels, on the other hand, are translucent. and put them against the black to see if i'd covered everything that i wanted to cover with the ivory. after i touched things up a bit, i put the tracing paper back on the white side and finished coloring with colored pencils. 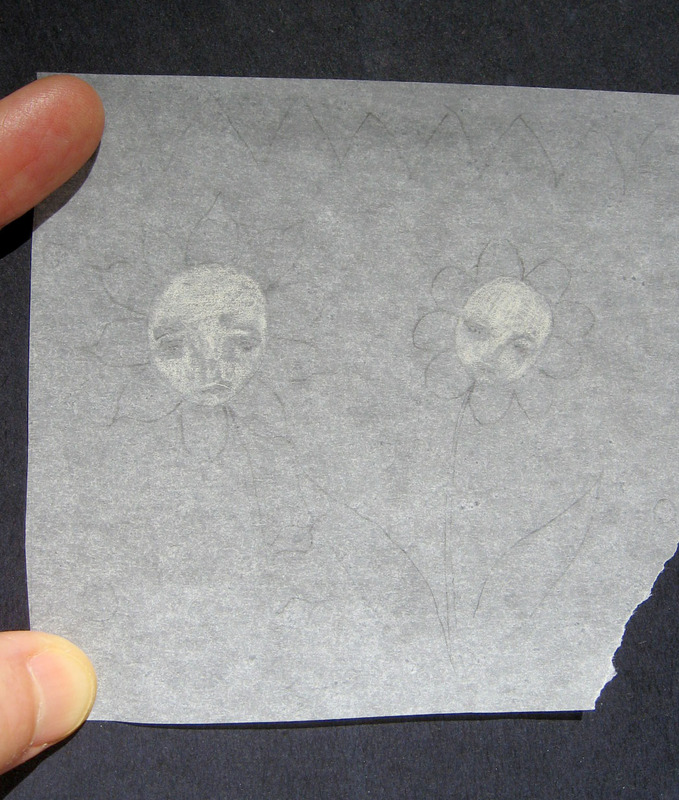 once i was done i tried putting the tracing paper over images in different books, but i didn't like any of the combinations. i liked it best on the ivory paper in my daily book - but not enough to leave it there for good! i taped it down temporarily so i could take this pic, then i took it off and put it in the manila folder for future use. Thanks for shareing your process with us. 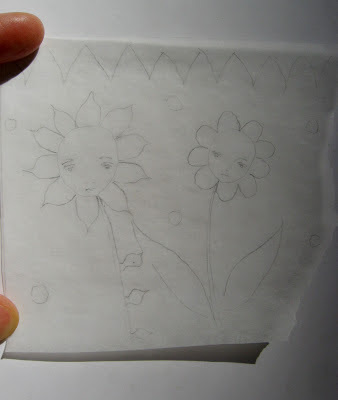 I have a pad of tracing paper which I have always wanted to do something with other than trace. I will have to give it a try. Love to you and thank you for what you bring to the world. It is always cool to see how other artist work. 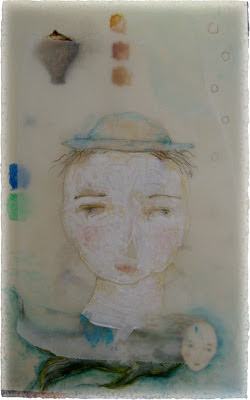 I am curious what made you try the translucent paper with paint to start with? 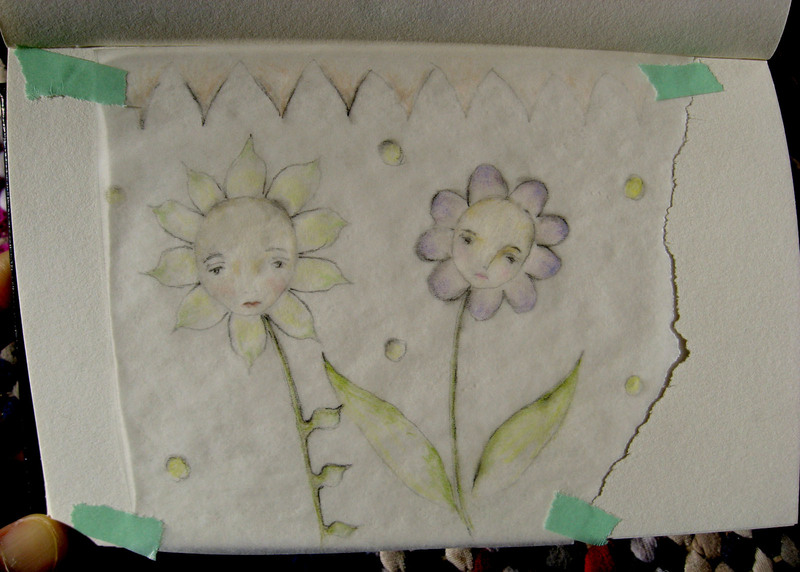 I always love your faces and especially your little flower faces. and I am fascinated by the tiny vessle in the upper corner. What is inside this ancient urn? I love how you experiment with materials and paper. 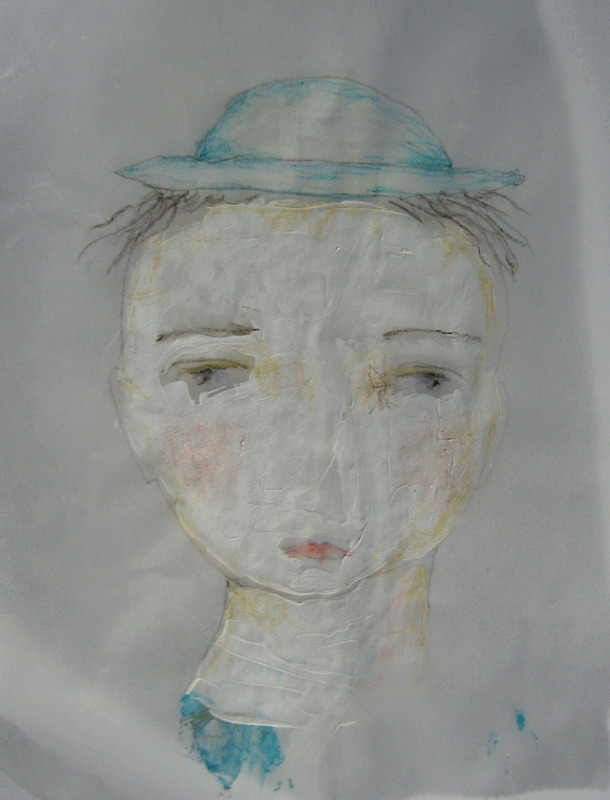 Your drawings have such sensitivity and soul. snow hearts!!!!!! LOVE and those itty flowers can grow in my yard anytime they want...loved learning about your process for creating these sweet gems of color and light. Since it's 6 below zero here today, your blog was a nice and toasty place to hang out for a bit. Snow! I love the marks you made in the snow. Always so generous in sharing the process. 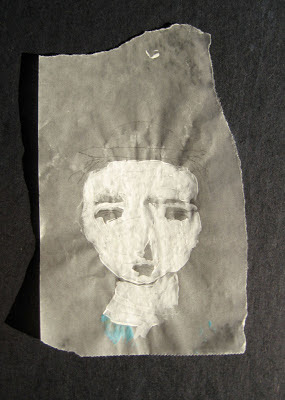 You know that we will all pull out our tracing papers and try it.. Thank you for the inspiration. Your sweet little flower faces have just made me so darn happy. Great tutorial Lynne! 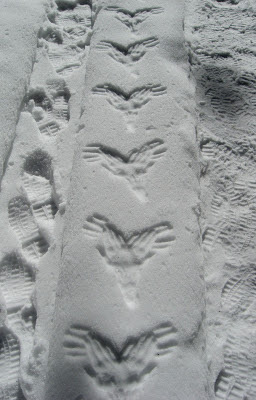 How did you make the bird marks in the snow? 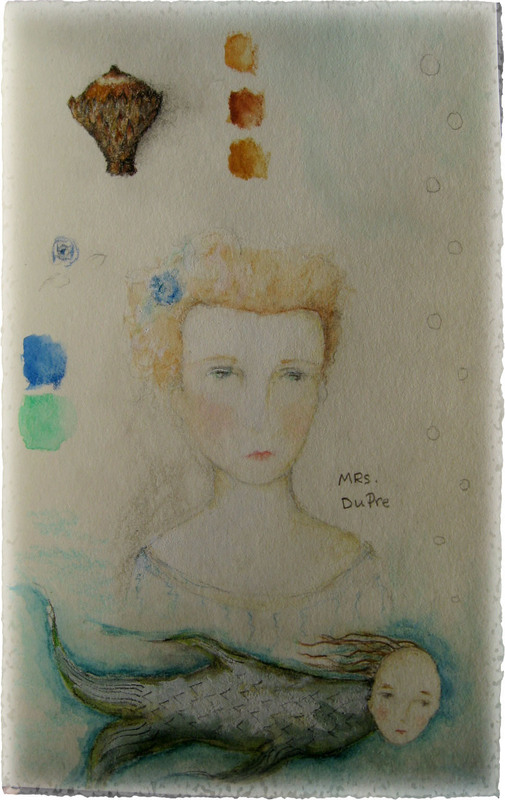 LOVE mrs. dupre .... a surreal feel to this piece. Very special. Glad you didn't cover up the mysterious Mrs DuPre for long. She is charming. first let me say I love Mrs DuPre. She has such an ethereal quality. Then let me suggest using acrylic mat or gloss medium to thin your paint to get the translucent or transparent quality you are looking for.